Join us for the DPA’s 50th Anniversary celebration on Saturday, October 13, 2018, from 7 – 11PM at the Sandy Burr Country Club. An Italian Buffet dinner, dancing to the Still Working band, fun and friendship. Tickets are available online here, or you can get them from members of the Executive Board! Tickets are now $25. Hope to see you all there! Sunday, September 23rd at Mansion Beach! 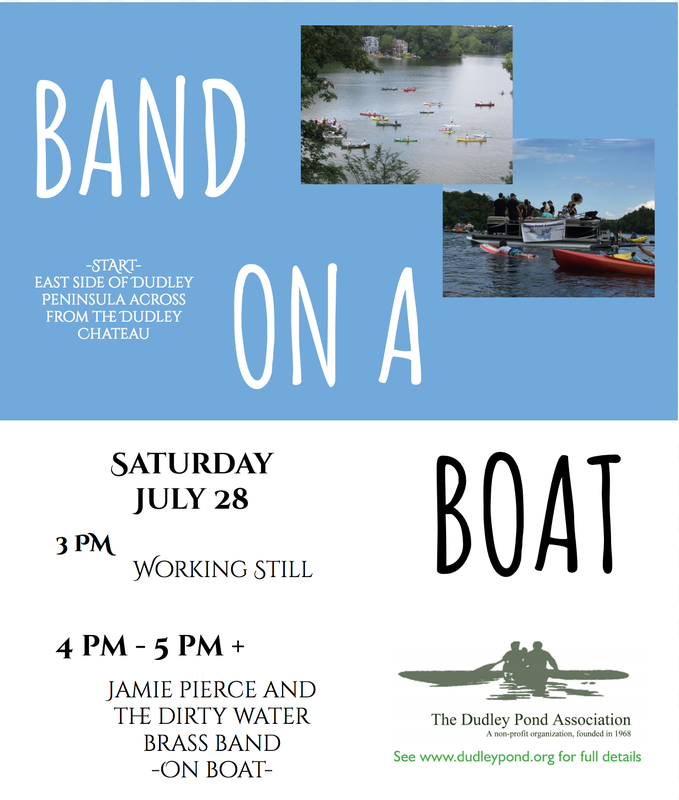 Jamie Pierce and the Dirty Water Brass Band will circumnavigate Dudley Pond starting on the east side of Dudley Peninsula across from the Dudley Chateau around and work their way around the pond. The two captains figure out their own route but the general direction will be to start on the Chateau side, then around the peninsula towards the outlet and then towards Mansions Beach. Or they could go the other way! Every year we have at least 40 boats, kayaks, canoes, pontoon boats, paddle boards, and swimmers following the band around the pond so join us by land or sea. Help us celebrate the DPA's 50th anniversary!!! To get the festivities going, Steve Robb's band, Working Still, will be performing starting at 3pm. See the DPA secretary email for location. REMINDER: 50th Celebration tickets still on sale!!! 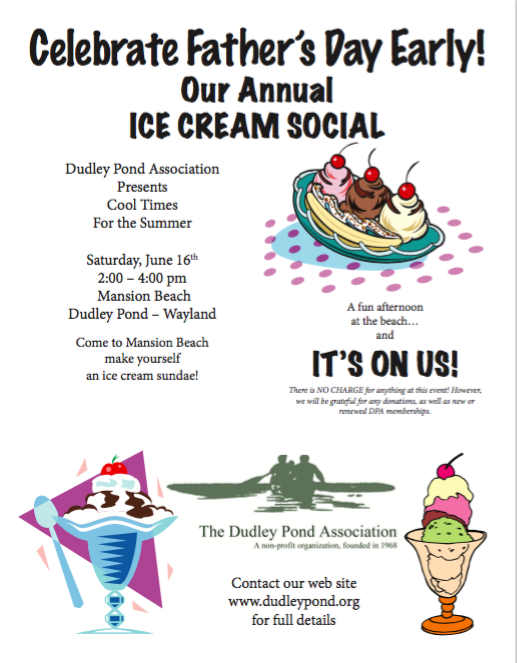 Come celebrate Father's Day early, as the Dudley Pond Association continues to celebrate its 50th anniversary with its annual Ice Cream Social. Join us at Mansion Beach, Wayland on Saturday June 16, from 2-4 pm. It’s open to everyone and its free! Make your own sundaes, bring your Dad and bring your friends and neighbors. 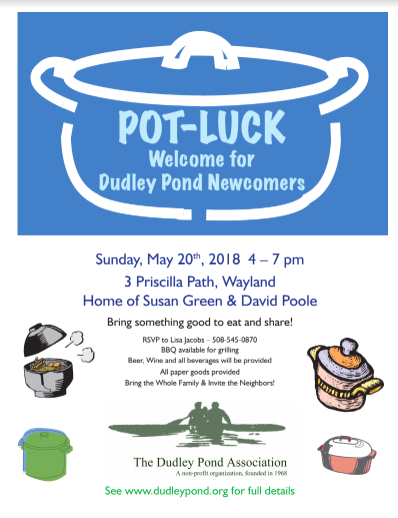 We have a great community and we would like you and your family to meet some of your neighbors and members of the Dudley Pond Association (DPA) board at our annual Newcomers Pot Luck - Sunday May 20, 4-7pm at the home of Susan Green & David Poole, 3 Priscilla Path, off Maiden Lane. Please bring something to share- we will provide all beverages, paper goods and a grill. You can RSVP to Lisa Jacobs- 508-545-0870. If you are unable to come but would like to be on our email list please send your email address to dpasecretary84@gmail.com. We hold many events over the spring, summer & fall, including the DPA's 50th anniversary celebration that will be held on Oct. 13, 2018. Welcome to Dudley Pond. We hope to see you on the 20th! Join us for the DPA 22nd Annual Dudley Pond Run/Walk on Sunday, September 23rd at Mansion Beach! Our 50th Anniversary Party will be October 13th, 2018! Tickets will be on sale soon!!! 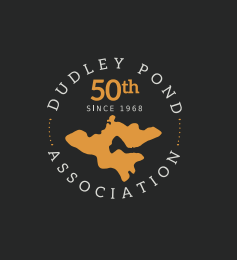 In case you haven't seen these in the Patch, Judy Currier has created a series of articles celebrating the 50th Anniversary of the DPA! Thank you so much Judy and the whole 50th Committee for all of your hard work!